Place the vegetable oil in a frying pan, and fry the chopped onion over a medium heat until tender. Add minced meat fry until the meat becomes dry and crumbled. Season with salt and pepper. Peel the potatos, cut in half and place them in a pot. Pour in just enough water to cover the potatos, cover the pan and boil over a high heat. When the potatos are tender enough for a bamboo skewer to pierce without difficulty, discard the hot water from the pot and place over a medium heat again to evaporate of the moisture of the potatos, and turn off the heat. In the pot, mash the potatos until no lumps remain with a potato masher or wooden spatula, add the condensed milk and mix well. Add the meat mixture prepared in 2. above, and mix well. Spread the mixture on a tray, and let stand until cool. When cool, divide into 12 equal portions and shape into balls. Coat each of the portions with the flour, beaten egg, and breadcrumbs in this order. Deep-fry in oil at 170 degrees. When the batter hardens, turn each croquette over occasionally while stirring gently. When the batter is crispy and turn light brown, retrieve the croquettes and drain on a tray. 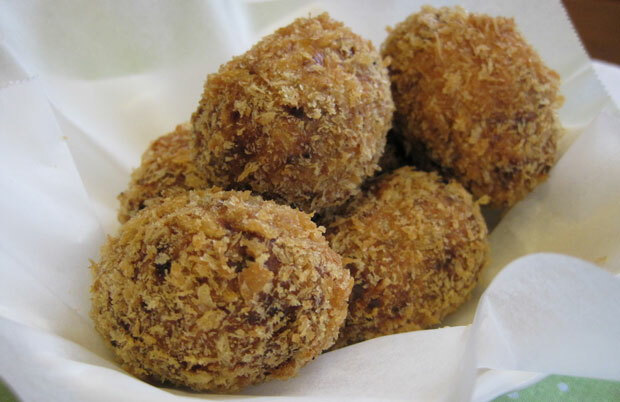 Soft-textured potatos such as the Danshaku variety are recommended for potato croquette. Be sure to mash potatos while they are still hot not to become them hard.